If John Lennon Airport sounds right at home in Liverpool, for obvious reasons, Jericho Lane is a very different matter. The moment Bill Lindfield points you in the direction of Jericho Lane when you fish Otterspool promenade, it is impossible not to wonder what link with the Holy Land gave rise to such an address in Liverpool 17. God and rod, it turns out, are the two major themes in the history of this suburb on the Mersey’s north bank. The original Otter’s Pool was part of a creek that fed the river and was a prize fishery for centuries. Local monks were granted fishery rights here in the 13th century and it was only in the late 1800s that industrialisation began to take its toll on fish stocks. "Twenty years ago, there was plenty of fish to be got on the Mersey waters,” reflected Samuel Kennerley at the time, one of the last generations of commercial fishermen to resist eviction from Otterspool’s Fisherman’s Cottage. “At this spot, salmon, codling, whiting, fluke, sole and shrimps (none better) - but now…the dirty water has driven them away. Garston Docks spoiled the fishery, and the Manchester Canal was the final nail." Meanwhile, farmland had been leased to a community of Puritans in the 16th century, whose religious devotion displayed itself in place names. The creek feeding Otter’s Pool was re-named River Jordan and one of the farms was christened Jericho. Were those devout folk still around today, no doubt they would be claiming the Mersey’s return to fishing form as a miracle. As it is, the mark has no shortage of pilgrims. Situated six to eight miles upriver, the prom is sheltered to the point where your fishing will rarely be blown off (although Bill says an easterly win can quieten proceedings somewhat) and it is blessed with an established supply of fish. No wonder that a recent two-day match there was won with 42 fish. The promenade was opened in 1950, its construction partly a case of ‘needs must’ for a city looking for somewhere to dump vast quantities of rock and gravel after scooping out the Mersey Tunnel. The result is a two-mile stretch that is not only popular with anglers but also joggers and those out for a stroll. A popular match venue, the prom’s easy access makes it particularly suited to disabled anglers, who have the bonus of fish within easy casting range. There is a channel 60-80yd out from the prom that is also good for fish but the tide run there is formidable (“like The Flying Scotsman on anything over 26ft,” according to one local angler) rendering it unfishable apart from during the slacker water of mid-tide. At any other time, you should concentrate your efforts on the margins. The mark fishes both by day and night, although as with any venue in an urban centre, you have to be mindful of neighbourhood rogues. A look at the local Internet message boards reveals the occasional story of parked cars being broken into here, although Bill has fished numerous competitions at Otterspool, travelling across the river from his Wirral home, and he says he has never known crime to be a major problem. “For tackle, I use a 12-15ft rod, 15-18lb line and a standard two-hook flapper rig,” he points out. “If I’m targeting codling, I’ll use 25-30in snoods and 2/0- 4/0 hooks and a plain lead if I’m fishing rougher ground. The margins can get a bit snaggy because there used to be a dump nearby. “If I fish the channel, then I use a grip lead of 5-6oz to counter the tide, although if it gets too strong the fish stop feeding anyway. 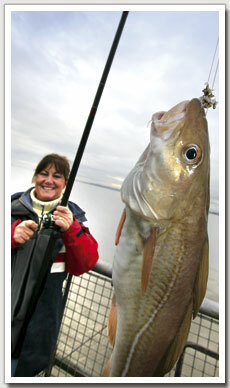 The whiting here come between 27 and 42cm, while codling weigh in at the 1lb 8oz to 3lb, which is about 35-60cm. There are a lot of small fish around but expect occasional fish to 10lb. There is a large car park at Jericho Lane. If the Britannia Inn’s car park on Riverside Drive is not too crowded already, the owner might be willing to allow the occasional angler’s car to use the pub’s car park, provided you intend to patronise the establishment once you have finished fishing. You should always ask first. Parking bays are also available off Riverside Drive.